NOTE: FOR AN UPDATED VERSION, DOWNLOAD (FOR FREE) THE VERSION PUBLISHED IN THE DARK HELIX EZINE. Preamble: I wasn’t planning on posting this story. It’s very personal and the idea came to me while I was watching children play on the shore during my vacation. But over the weekend, I came across a some very personal posts and stories by other people. They reminded me that everyone suffers pain and loss at times in their lives, and that as much as Life hurts, it’s important to remember that pushing through it is possible, even necessary. So, I hope you enjoy this story and are encouraged by it. I used to love the ocean. As a child, I would plant myself on the white, powder-fine sand and watch while the waves broke against the shore. Even then, young as I was, something about the rolling of the waves felt like magic to me. Maybe it was the planes of aqua coloured water foaming into roiling, white tips; the waves were like the sea’s breath, the surging soul of a mysterious, marine world. Sometimes, the receding dregs left gifts behind on the beach: shells, twisted driftwood or glistening jellyfish. I felt like a princess and the sea, my first and most generous lover. But that was before. I have grown up since. When I visit the sea, bits of discarded plastic are left behind for me now, and pieces of broken bottles, not jellyfish, glisten like jagged jewels in the sun. 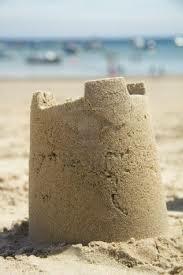 Today, my daughter builds sandcastles and moats in the same powder-white sand I used to build in. How futile. Piling up columns of sand when the slightest misstep causes them to crumble. I sigh while pulling down the front of my sunhat against the sun’s glare and continue to reflect on my younger days. The tide always swept my projects away, leaving no sign of them behind. Still, back then half the joy was in the creation of the thing. The happiness I’d felt tempered the loss so that I didn‘t quite mind so much. Funny how our perceptions change over time. But just as I imagined my parents had been unwilling to burst my bubble, I can’t tell my daughter the truth. I let her fill and refill the sand into various sized yellow, red and blue pails, press it all down and dump it all out, over and over. I watch in aggravated silence while she carves doomed tunnels and trenches and rebuilds the walls when the water she dumps into the canals are breeched. She is just a child. Innocent and un-phased, her world is painted in shades of aqua and sea-green and the sea god still leaves pretty pieces of shell and smooth driftwood on the beach just for her. I have since constructed my house on a barren beach. Smiling and laughing, my daughter runs up to me. Sand is worked into the creases of her shorts, is packed under her nails, and all I can think of is how long it will take to get her all sorted out. But she is radiant, the joy shining through the dirt splayed over her face. Even her eyes are aglow. “Mom!” she cries, “Did you see what I made?” Then she’s off, running down the list, providing a play by play of just how she did it. Towards the end of her telling, I begin to see a crease deepening between her brows and her eyes begin to widen with understanding. She looks from me to the beach. “What is it, honey?” I ask, though I already know the answer. Pressure builds in my chest. The truth rises up into my mouth but I hold it back. I can’t do it to her, not yet. Not when there is more time for play and make believe. Isn’t that what adults always lament? Not having enough time to be children? “Honey,” I begin and then stop, still not knowing what to say yet hoping wisdom would somehow come to me. She holds my gaze. Truly, she is braver than I had given her credit for. But then, hadn’t she watched while I picked up and re-knit the tattered pieces of our lives? Hadn’t she cried with me and held my hand when the ghosts of loneliness haunted my sleepless nights? And yet even now, she still looks to me with the expectation that, somehow, I can explain the madness that is Life, as though I have the power to resolve its many discordant chords. The tide is rising, the sound of the breaking waves growing louder in my ears. But her smile speaks louder. Smiling back, I squeeze her hand and with the other, take the shovel she is offering. Then I lead her to a spot higher on the beach, one that is more difficult for the waves to reach. Thank you very much, Helen. 🙂 That means a lot to me. thank you for writing this. i have never had the joy of children, maybe in another life, thank you for writing this strong, touching story of love and life. This is gorgeous and inspiring. I loved it. Thank you, Kari. 🙂 I’m so glad you enjoyed it. this is a bery nice story, well done. i write short stories myself. Thank you, Christine. 🙂 Nothing like nature to teach some of Life’s most important lessons. 🙂 Thanks so much for commenting. I always enjoy hearing what you have to say. A beautiful touching story. In life there is still joy that overcomes all sadness. A reason to go on, rebuild, a reason to live. Gifts from the hearts of our children. I liked this very much! Omg the tears… Thank you so much for that. Ongoing I’m a mess. Glen has to read this. I’ll tag him, if you hadn’t emailed him already. This was … I can’t think if the words. Thank you for writing some incredibly touching. He’s read it but I think he was too manly to shed tears. 🙂 Thanks, AJ. Your heartfelt response made revealing myself in this way, worthwhile. He has it added to his reading list. I think he will read it at work if he’s not too busy. 😉 he’s not too proud to do that. Lol. He’ll tell you. 😉 thank you again. I love it. I will read it again. LOL. He was a good sport LOL. Dyane, this is a wonderful story of perseverance and protection. And deception. Although, I’m not a parent to any children that survived, I would want to protect them from the disappointment that life brings for as long as possible. Unfortunately, life is unbearably cruel at times and, at some point, we have to face the cold reality of it. (I’m not to proud to cry). And I wasn’t anywhere near crying this morning. I’m secure. Exactly. Few things come easy in this Life. Thx for your comment, Glendon. I always like to hear what you think.